For Category A2, we use similar ER6n machines as Catagory A but restricted to the maximum allowable power of approx 47bhp. Lessons on these 650cc machines are for 2 hours with a maximum group size of 2 customers per instructor. There is also a six session pack option available. Learning to ride on a large motorcycle does not necessarily mean you will start on a large motorcycle immediately. Post CBT or by assessment our instructors will be able to tell you how many 125cc lessons you might need to take before proceeding to the bigger bikes - of course if someone has previous riding experience they may well start immediately on the big bikes. Our instructors will decide when they feel it is safe enough to allow you to progress to the large machines; this is for your own safety. It is our opinion that it is good practise to achieve good machine control before transferring that skill to a much larger machine. This improves the safety and enjoyment of learning, we believe in the learning curve not cliff! As we have insured the right riding standard before going on to these bigger bikes we can be more sure of how much training pupils require, the majority of pupils successfully complete a 'Standard Pack', as mentioned above, which consists of 7 sessions, bike & Test fees. Don't worry, if more is required extra session(s) can be done as you go along. 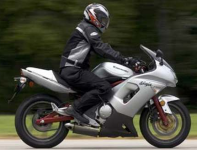 The bikes we primarily use for Category A2 are Kawasaki Er6n 650cc machines. For prices on A2 bike lessons and the variety of Packages (discount included) that we offer please see our Price List.